Right in the centre of West-Mainland Orkney, we find Maeshowe Chambered Tomb. Covered by a thick layer of turf and grass the excellent dry stone structure is one of the major monuments of the UNESCO World Heritage Site known as The Heart of Neolithic Orkney. Inside the tomb, the biggest collection of Viking runes ever found in situ survived until today. Most of the 23 inscriptions from at least 15 different hands simply show a name followed by the characteristically "RR" for "reist runa" and thus telling us who was the one who carved the runes on the wall. Nothing else but ancient graffitis they are. A Lady Ingibiorg is celebrated as one of the most beautiful women of the world – this is stated in standard types of runes, but the name of Erlingr one of her admirers is written in tree or twig-runes. One of the most skilled carvers of runes leaves his messages in a very unusual stile. He carved his runes with an axe that killed Gauk Trandilsson, a Viking from Island, some 150 years before. Asgrim Ellida Grimsson killed Gauk and his Great-great-great-Grandson was Thorhall Asgrimsson. Thorhall was the captain of the Norwegian longship that brought back the Earl Rongvald from Bergen to Orkney on his return from the crusade. 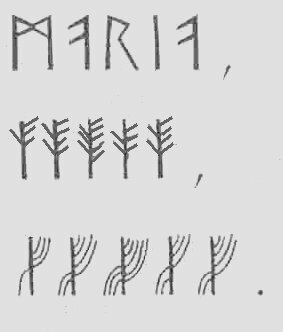 centre line: in tree or twig runes (younger futhork alphabet; twigs to the left indicating the line, twigs to the right indication the position of the letter within the line when grouped in the classical way of three lines with 8 letters each); bottom line: Thorhall Asgrimsson’s personal stile. A woman carved one of the longest runic inscriptions ever that survived: Lif. She was a cook to Earl Rognvald and his crusading followers and she accompanied him on his pilgrimage to Jerusalem. She tells us that the tomb was already very old; it dates back to a time far beyond the early days covered by the genealogy of the kings of Norway. Another crusader, a certain Simon, leaves a note that at the time when they carved the runes the tomb was already cleared out by Haakon. It took Haakon two days to bring all the treasure out of the grave and to hide it in another place a bit north of the tomb – lucky will be the man who will find the treasure. Some of the runic inscriptions are accompanied by additional graphics: Something like a serpent, a dog’s head (sometimes interpreted as a walrus) and the most famous of all – the Maeshowe Dragon.